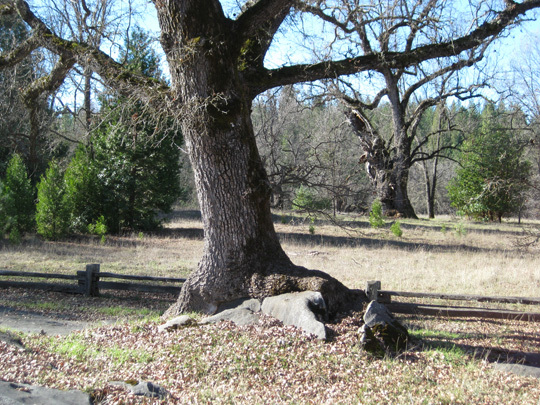 Every year about this time, when the days are mostly rainy or foggy, I find myself drawn to Indian Grinding Rocks Park, a gem of a state historical park in the foothills, east of Sacramento, and about eight miles east of Jackson. At 2400′, the skies are often blue in January, and green shoots poking up through the brown grasses hint at spring. 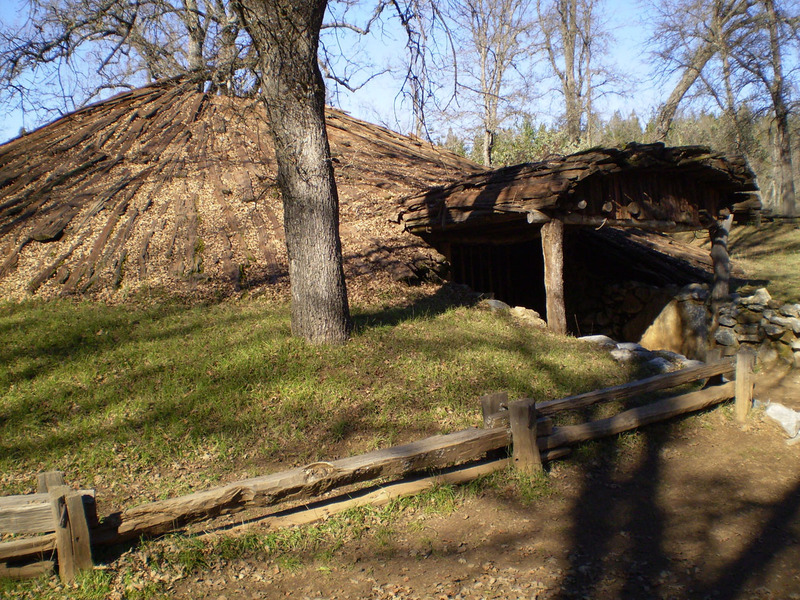 The Miwok people called the place Chaw’se, meaning “grinding rock,” and camped here in the fall to gather and process acorns. 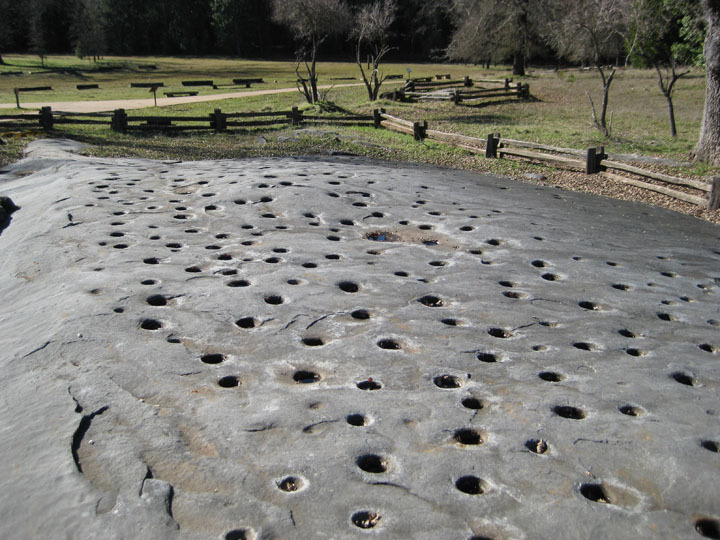 There are 1185 mortar holes on soft slabs of limestone where year after year the women pounded acorns into flour and meal while the men hunted, to lay in supplies for winter. Petroglyphs are carved on the mortar slab, though some of them, estimated at 2000-3000 years old, are becoming faint. An excellent museum displays arts, crafts, tools, and California tribal history. Native American teachers demonstrate crafts like basket weaving and flint knapping on the second saturday of most months. Native people use the reconstructed roundhouse for ceremonies at various times of the year, with the largest, the Big Time, at the end of September. For several days, acorn harvest time is celebrated with native food, crafts, storytelling, and public dances during the day. Tribal members hold privae ceremonies at night. Going in January is a great way to shake off cabin fever and simply enjoy the little valley, although it’s too early to get the full benefit of one of my favorite parts of the park, a self-guided trail along the creek and up a hillside, with markers for 18 plants the Miwok used for medicinal and other purposes. Nothing is in yet in bloom, so aside from tree-based medicines like willow bark, there is no chance for real recognition. 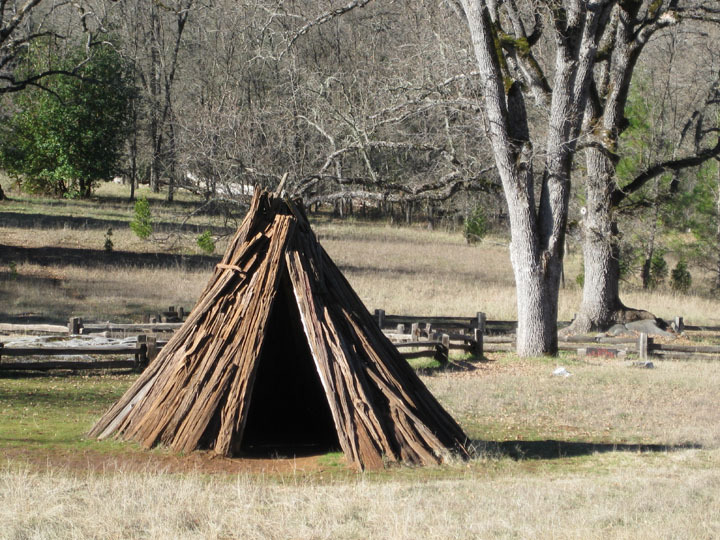 The park service has reconstructed the temporary bark structures the Miwok used during the acorn harvest. A friend camped in one in the fall with a group of boy scouts and said the nights were really cold! There are nice picnic facilities, but no concessions so you need to bring snacks at a minimum; the nearest town is three windy miles away. A “primitive” campsite with 27 spaces overlooks the park; I’ve had friends drive up at the start of holiday weekends with no reservations and find room. I have always found something compelling about winter in the California foothills, something plain or basic about the simplicity of sky, tree, and grass. The abundance of foliage, humming insects – and crowds at a place like Chaw’se – will come later. Now there is just the growing warmth of the winter sun, the voice of the wind, and a feeling of home that people have shared in this spot for thousands of years. This entry was posted in Travel and tagged history, Native American, travel. Bookmark the permalink. I had no idea this place existed! It looks great. I will have to plan a trip soon. Thanks for posting about it.